Full sun with partial afternoon shade. None. Heliotrope cannot tolerate cold temperatures. Alyssum, Lobelia and Dusty Miller. As one of the most fragrant annuals you can grow, find locations close to outdoor activity areas for heliotrope. Upright nicotiana makes an excellent companion plant with strong evening fragrance. Sow seeds in warm, moist seed starting mix, or start with purchased plants. Seedlings are very slow-growing, so most gardeners buy plants in spring, many of which are grown from rooted cuttings. 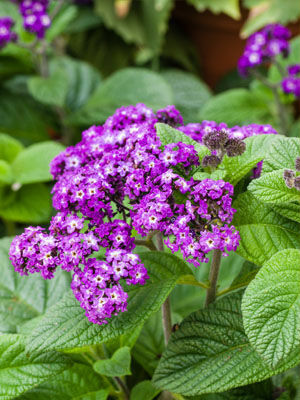 Heliotrope develops lush, dark green foliage topped by fragrant flower clusters that may be purple, lavender or white, depending on variety. To grow bushy plants, it is important to pinch back the seedlings when they are young. Heliotrope does not do well in very hot, humid weather. It grows best in climates with cool nights. Warning: Heliotrope is poisonous to pets and grazing animals. Grow heliotrope only in hanging baskets if you have curious pets.